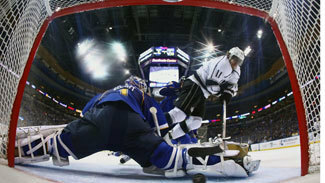 ST. LOUIS -- Instead of coming out with a sense of urgency following a Game 1 loss to the Los Angeles Kings in the Western Conference Semifinals, the Blues played without passion and desire in the opening 20 minutes against the confident Kings, who blitzed St. Louis and tossed the Blues into an insurmountable Game 2 hole. With the Blues down 4-0 after 20 minutes, the clapping of thunder sticks from the 19,366 spectators jammed into Scottrade Center Monday night was replaced by a stunned silence. By game's end, the Blues are in an 0-2 series hole against a Kings team that heads home with visions of closing out the series with a sweep of Games 3 and 4 in Los Angeles. The Kings start was the kind of beginning the home side was looking for but did not come close to getting, leaving players and coach Ken Hitchcock scratching their heads afterward. "It's unacceptable, it's embarrassing the way we came out in the first period," defenseman Barret Jackman said. "You can't give any team chances like that and expect to win a hockey game." "Just a bad start," Blues winger T.J. Oshie said. "Guys weren't ready to go, and they were. We knew they were going to be coming out firing. ... We weren't ready physically and mentally -- most importantly mentally. We need to be smarter, we need to work smarter." Instead of smarter, the Blues worked themselves into a period of blunders, as the Kings controlled the tempo, controlled the ice and are now in control of the series. "It's kind of disappointing that we didn't have more dig-in and more buy-in or solidity as a group to push them back and see what they're really made of," Blues captain David Backes said. "But we've got other levels that we can get to to hopefully make them earn it more." Hitchcock said the Kings earned every bit of what they got Monday night, and the results were crystal clear. "Full marks to them," Hitchcock said of the Kings. "Their emotional investment in the first period was greater than ours. We started to play later [outshooting L.A. 24-5 during the final two periods], but you don't know how much they're sitting back and stuff like that so it's a hard read for them. Their goalie [Jonathan Quick] was good again. We pounded a lot of shots in the last two periods, but we only scored two goals. "We've got to invest a lot more early in the game. That's the nice part about playoffs, it's one game, it's one loss. Move on." The Blues, who played without injured defenseman Alex Pietrangelo, now move on to a building in which they were blanked in twice this season. With the way Quick is playing, combined with the growing confidence of the Kings and the wavering confidence of the Blues, it will be a tall task to get this series back to St. Louis next week for Game 5. "We've played awfully well on the road in the playoffs," Hitchcock said of his team's 2-0 mark against San Jose in the first round. "It's only one loss, it doesn't feel good. The first period doesn't feel good. The way we played on the power play [0-for-9 Monday, 0-for-12 in the series and 0-for-26 against the Kings this season] doesn't feel good, but we've got two days to regroup here and put our best forward. "All you can do is ask for your best, and [Monday] wasn't our best. [Monday's] first period was not our best. We need to make amends for ourselves." Backes, who assisted on goals by Andy McDonald and Matt D'Agostini on Monday, agreed. "We've got one soldier down [Pietrangelo] from a play in Game 1 and rather than responding with desperation and urgency and that vengeance-type of mentality, we came out flat and let them jump all over us. It's just got to be better."